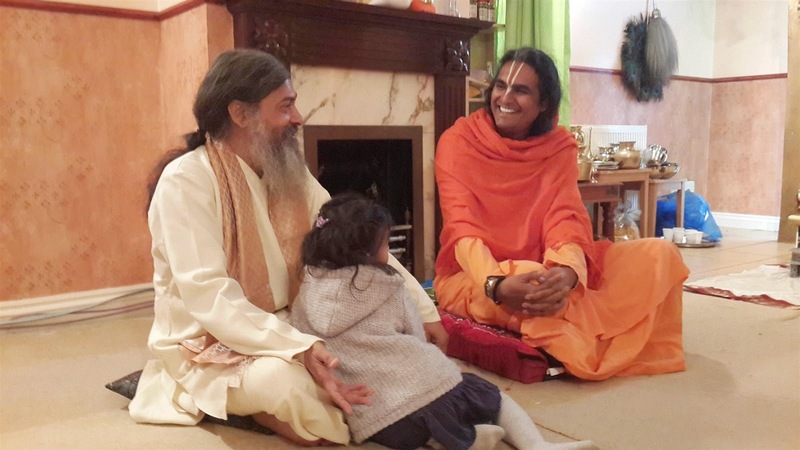 Guruji spent the whole last week in the UK, and what a week it was! When some of us back in April were looking at Swami’s calendar, we were tempted with the idea of going. It seemed like a promising proposition: Not too far away from Shree Peetha Nilaya, many devotees who are ready to offer accommodation, a rich combination of events, starting with a Satsang on Monday (see blog post), and ending with a Darshan on Saturday (see blog post), and inbetween the main event, the glorious and powerful festival of Narasimha Chaturthi (see blog post) at the Bhakti Marga Sri Lakshmi Narasimha temple in Feltham. We felt that it would become a great week, and as it turns out, the week became even richer, and exceeded all our expectations. 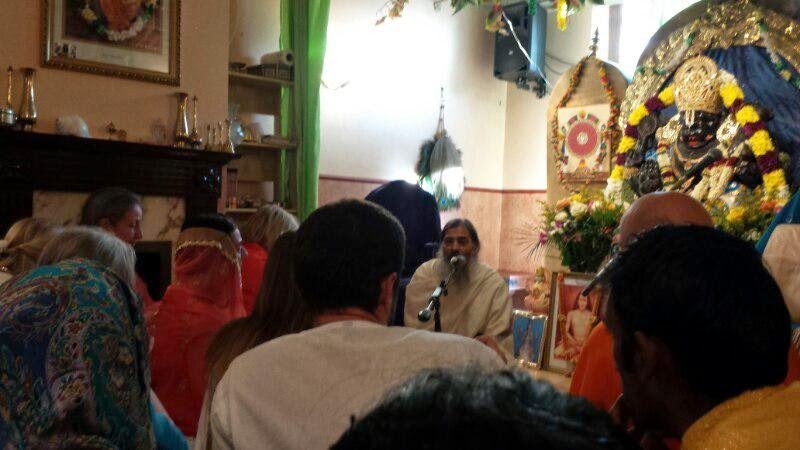 The week began with a Satsang that took place in East London, Monday evening, light drizzle outside, in a “cool” location, literally, cause the temperature in this former church was quite low, and the atmosphere was a bit cool. Also, Guruji seemed toned down a bit, somehow less forceful than usual, as he was attuning himself to the many newcomers - amongst the estimated 150 guests - who met him for the very first time. I felt transported 10 years back, and reminded of Satsangs in earlier times. Guruji patiently and gently introduced the new visitors to the basics of his teachings as he would answer the questions that were posed to him. One of the topics Guruji covered was that of chanting mantras, where he explained that the mind is like a tree full of birds, symbolising all the different thoughts that are flying in and around our head. When we stand below the tree and start clapping, then the birds will fly away. When we chant the Divine Names, it is as if we stand below the brain, the tree, and we start clapping, and make all the thoughts go away. When we sing the glory of God, the vibration of the Divine flows through us. The more we chant the Divine Names, the more the Divine qualities within ourselves start to reflect to the outside, and we get transformed. Next day, Narasimha Chaturthi, contrasted strongly. Now the vast majority of the visitors who squeezed themselves into the packed full temple house in Feltham were no “newbies”. Guruji was in full force as he poured litres and litres of abishekam blessings over the great Murthi of Narasingha Dev. Again I felt pulled back in time, in the many more intimate moments that took place in the temples and private homes of Mauritius, Switzerland and UK in the early years of his mission, and also in the first Ashram in Steffenshof, before we moved to Springen. Many who had witnessed other Chaturthis in Feltham before, said that this time topped the ones before. 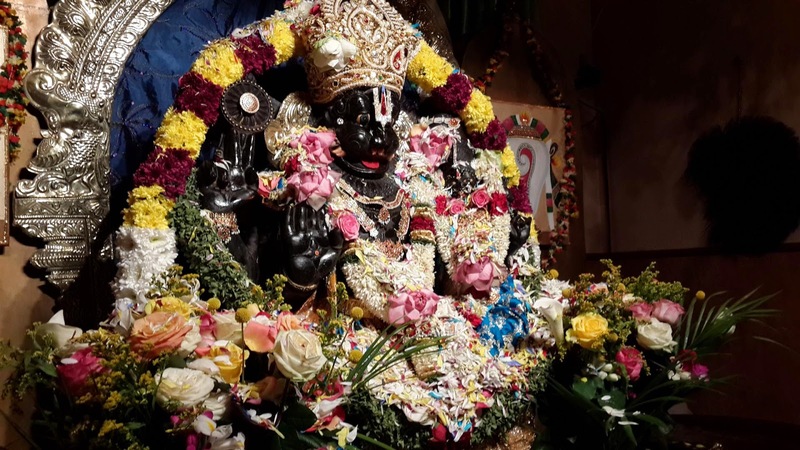 It is not possible and important to compare, but it suffices to say, that it was a powerful night, with powerful chanting, and bestowing powerful blessings from Lord Narasimha to those who were fortunate to be in His presence. And for sure, out of his unlimited mercy, the blessings were extended also to everyone who was not there, and even to those who do not know Him or are not interested in Him. 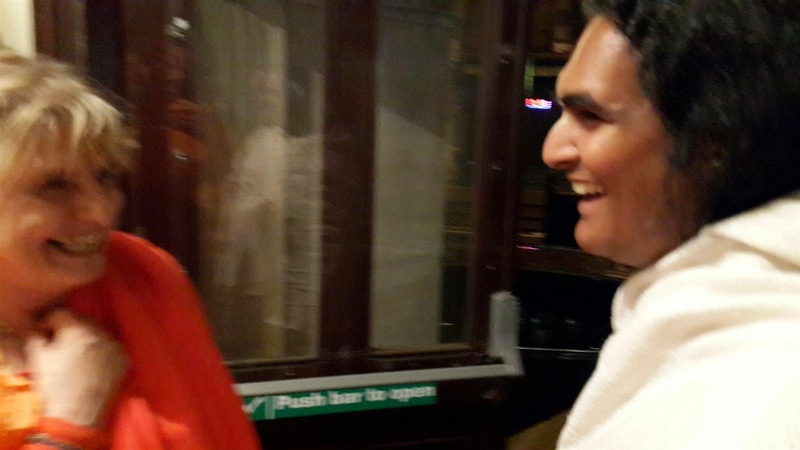 Also a nice bonus, this year, Swami Vishwananda’s dear friend Dr. Satya Narayana Das joined Him for the feast (his first visit to London since 1978! ), and wonderfully explained the tale of Lord Narasimha and his great devotee Pralad. Amongst many things, he explained that true devotees, such as Pralad was, are fearless. Every opportunity they receive is to praise God. And that our life is meant to serve the Lord – full heartedly! 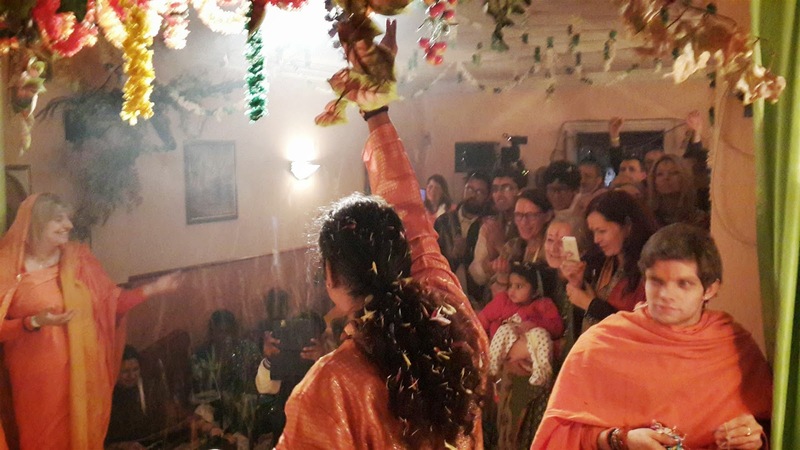 The Night ended late, and it was the first of 5 long or rather short nights, with little sleep, and the strong sense of intimacy of a spiritual family, one of a kind, that of Sri Swami Vishwananda. Not only devotees from the UK came, many from other countries, Portugal, Spain, Russia, Germany/SPN, Greece, and even the US. 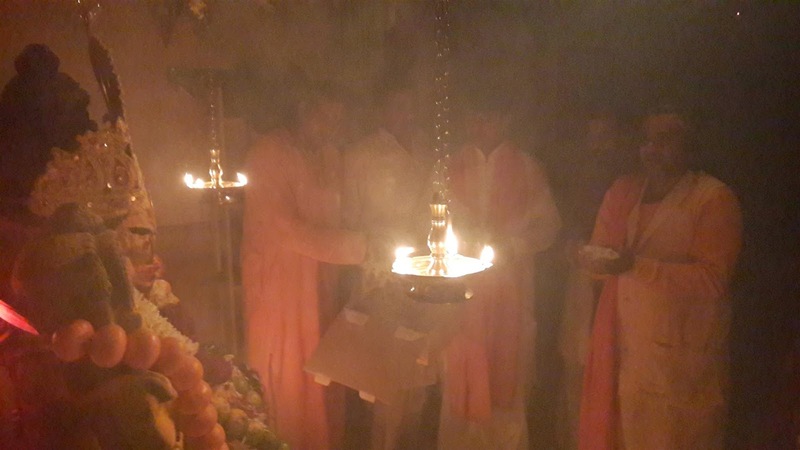 Unfortunately, at Shree Peetha Nilaya, and also elsewhere, such nights are rare, and all the more we appreciated them, being aware of their precious nature. 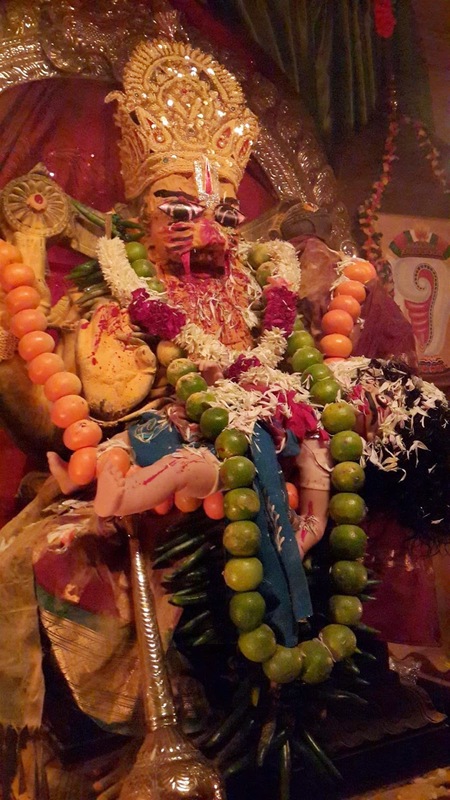 Wednesday was the most laid back day, due to the intensity of Narasimha Chaturthi the night before. 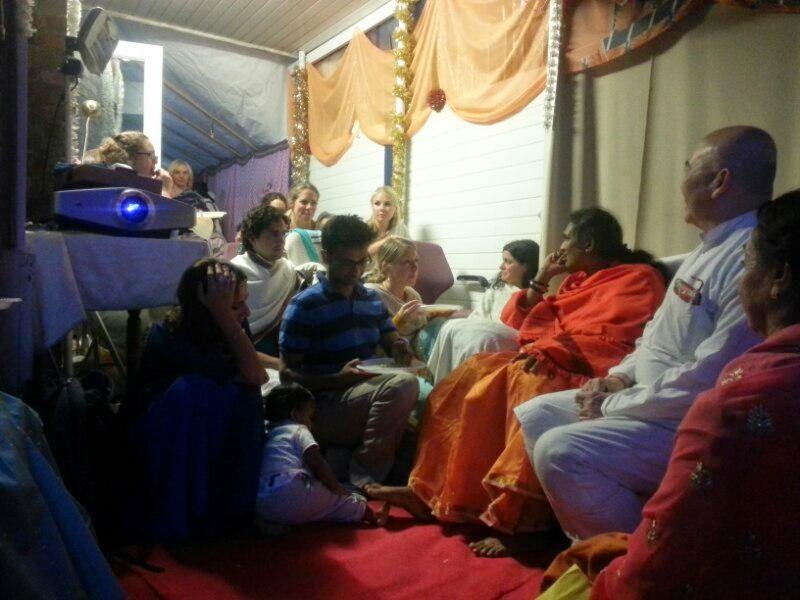 We had the privilege to enjoy a Satsang by Satya Narayana Das at Feltham. Many of the numerous visitors who came, heard him for the first time, and received valuable insights from the treasure box of his accumulated wisdom for the spiritual path. Dr. Satya Narayana Das (SND) is one of the world’s greatest vedic scholars, and it is always a great joy to hear him speak. One question was about the Lord’s own abode, which is called Vaikunta, his eternal place in which he resides. Does, when the Lord comes on Earth, the place where he stays, become also Vaikunt? SND explained that God comes with his own abode, and whilst the place where he stays on the physical plane is material in nature and stays material, it becomes a place where Vaikunta becomes manifest. Actually, Vaikunta is always here, but we are not attuned into it. Most of us normally watch the “material channel”, because the mind and the senses are drawn to that frequency, but if we tune into the “Vaikunta Channel” and we change our consciousness we can attune to the higher consciousness. There again lies the importance of chanting mantras, as they act like a remote control to attune to the frequency of the Lord. He went on to explain that when the Divine descends (which is what the term “Avatar” means), then He overpowers all the other channels, then the Lord desires that everyone sees him, whether or not we have done sadhana. He makes himself manifest in the material world. So in short: He is not making the particular place into Vaikunta, but he is manifesting Vaikunta in this particular place. Same but not same. And everything exists already, it is a question of what we are attuned into. 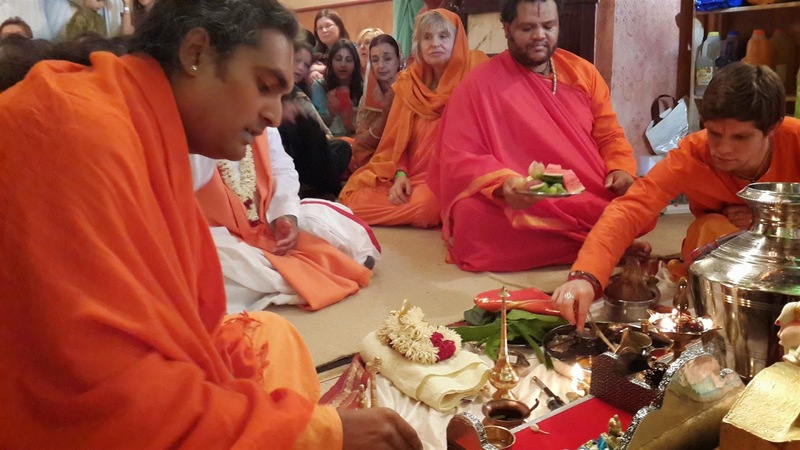 In part 2 I will cover the second half of the week, in which we had many more wonderful and joyful moments in the sweet and loving presence of Sri Swami Vishwananda.